We have seriously gotten into Baba Ganoush over the last week or so. Seriously. We’ve probably gone through 1.5kg of eggplants, if not more, between the two of us. In a week and a half. I had eggplants coming out of my ears, and let’s just say that eggplant is not Tyler’s favourite vegetable. Of course, he’ll eat it rolled around a cheesy stuffing. He’ll eat it in curries. But other than that, he’s not so fussed on eggplant. So I threw caution to the wind and tried something that I thought he would probably hate. Sometimes it pays to take risks. This kid inhales my baba ganoush. Almost as quickly as I do! I don’t think there’s ever been so much silence (with the exception of during dessert, of course). We had a friend up from Melbourne last weekend who had lunch with us one day, and I served up the baba ganoush to start. He tried it, then admitted to me that he had only tried it once before at a restaurant and hated it… but loved mine! Pretty awesome feedback, if I do say so myself. The making of baba ganoush is pretty fun. You get to burn stuff! (I’m conveying Tyler’s excitement here, and just a little bit of my own). And we love saying it, too. BAba GaNOUSH! Extra emphasis on the ‘noush’. 1) Turn on your gas burner to high. Working with one eggplant at a time, char the eggplant on all sides (should take a total of around 5 mins per eggplant). You’ll know it’s charred when it smells something like a mixture of pot and a bonfire. So whenever your nose conjures up an image of a bunch of hippies playing guitar and singing peaceful songs around a bonfire, you’re there. 2) Set the eggplant aside to cool. Once cool, peel the skin off the eggplants with your fingers – use the stem as a grip while you peel, and cut the stem off once all the skin has been peeled off. The skin should come off really easily. 3) Place the garlic cloves in the TM bowl and chope for 3 seconds on speed 7. 4) Add eggplant flesh and remaining ingredients. I loved the crunch of adding whole cumin seeds to mine, but Tyler hated it. Consider separating the big batch into two batches once mixed, and stirring the whole cumin seeds through half the batch for the grown ups. Mix all ingredients for 15 seconds on speed 4 for a slightly chunky dip, or for 20-30 seconds on speed 5 for a smoother dip. 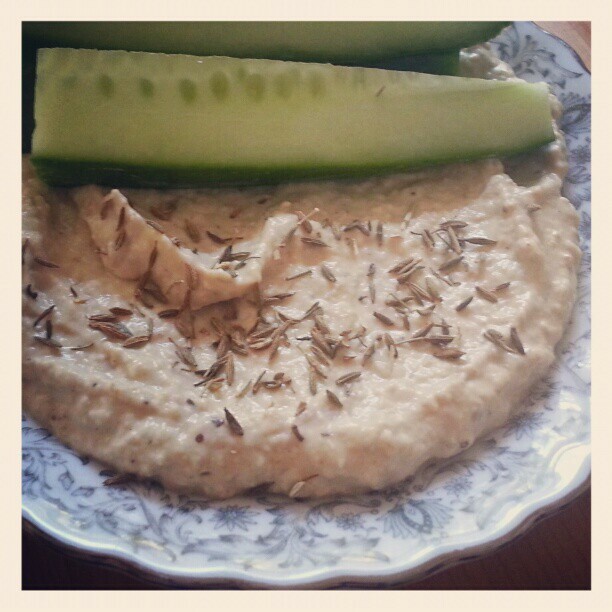 Great adaptation of a basic recipe for this enchanting dip, Sarah! Many thanks. I like the addition of lemon juice to give it depth and tang. Off to make some in my TM31 now. Cheers!